Whether its a natural disaster or just an unanticipated power outage, having emergency lighting available is critical to helping you navigate the darkness. 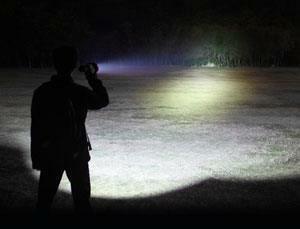 LED flashlights are the new norm, and they provide super bright light that lasts for hours and hours. Keep several flashlights at home and keep one in each of your cars. Lightsticks and emergency candles can provide low level lighting for extend periods of time, so they are good options to consider also. This lightweight and compact Survival Candle was three wicks. This candle will remain lit for 36 hours with one wick lit, or 12 hours with all three wicks lit. The more wicks you light, the more light is produced. This flashlight is make of high impact plastic and features long battery life. It measures 7 inches in length. 2 D batteries not included.